Perfect and gorgeous. I wanted something simple yet pretty, not too feminine. This set looks great and fits well on my bed. I would highly recommend this set! Transform your bedroom into a relaxing coastal getaway with the Madison Park Amalia 7 Piece Cotton Printed Comforter Set. 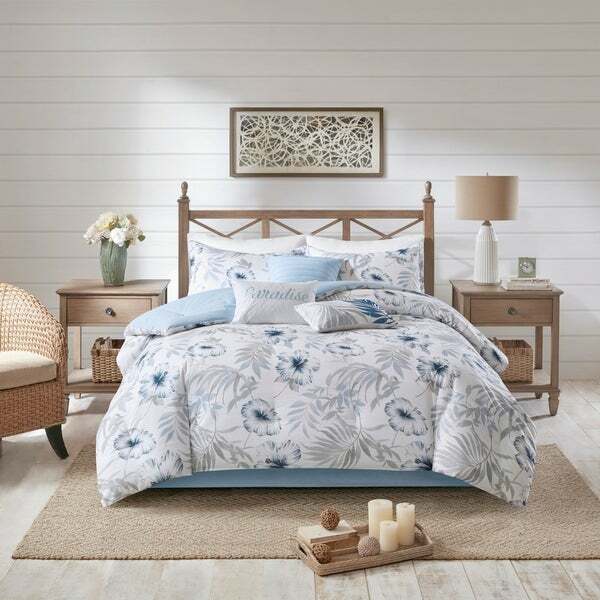 The 100-percent cotton percale comforter and matching shams showcase a tropical leaves and hibiscus watercolor print design in blue hues on a soft white base fabric. A solid blue reverse and bed skirt complement the top of the bed completing the look. Two oblong pillows and one square decorative pillow features pleating and embroidery details, providing the finishing touches to this cotton coastal bedding set. With hypoallergenic filling in the cotton comforter and pillows, this tropical comforter set easily refreshes your bedroom décor and is machine washable for easy care.